TINA BROWN is a transplant from New Hampshire where she grew up the youngest of three children. Her artistic creativity was enthusiastically supported throughout her schooling. Tina earned a scholarship to The George Washington University where she eventually received a Master of Fine Arts with her focus in printmaking. Her artistic endeavors were interrupted for a few years while she pursued her rowing career. In 1992 she competed on the US Rowing Team in the Olympics in Barcelona, Spain. Since 1998 she has thoroughly enjoyed being a part of Orcas Islands’ community. Over the last few years Tina has become enamored with decorative papers. 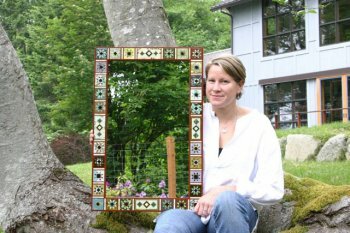 She makes Accordion Card Photo Albums as well as lacquer-coated, paper-collage images on wooden mirror frames and panels.